I still have more to say about our European trip. I realize it has taken me a long time to write about it, but it has been a busy summer. Before I get back to our adventures I wanted to share a recipe we have been enjoying before the last of the summer peach season slips away. I first wrote about this pancake in February using apples, but I said you could substitute other kinds of fruit. 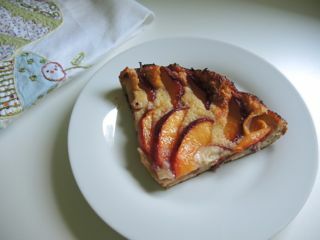 Here is the recipe for the peach or nectarine version. It is slightly different from the apple pancake recipe. 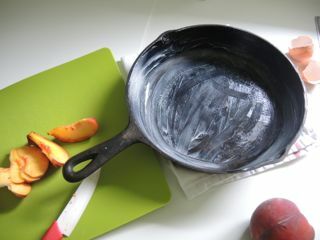 Instead of tossing the peaches in cinnamon and sugar like the apple recipe, sprinkle half a tablespoon of sugar in the bottom of the buttered pan. 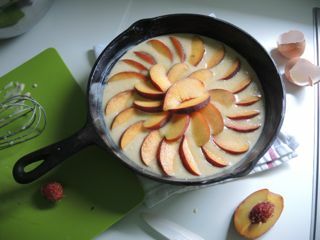 Pour in the batter and arrange sliced peaches or nectarines on top. Sprinkle the other half of the tablespoon of sugar on top reserving the final tablespoon to use after the pancake is out of the oven. When I make the apple version I peel the fruit, but I like to leave the skins on the peaches or nectarines for added flavor. Feel free to remove them if you prefer. Preheat oven to 425 degrees F (218 degrees C). Generously butter a 10-inch cast-iron skillet and sprinkle with half of one tablespoon of sugar. Sift flour, one tablespoon of sugar, cinnamon, and salt in a large bowl. Whisk eggs, milk, melted butter, and vanilla, in another bowl. Add to dry ingredients and whisk to combine. Thinly slice peaches or nectarines. 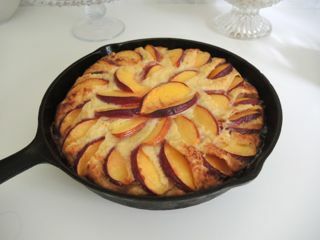 Pour batter in skillet and arrange peach slices on top. Sprinkle with the other half of the first tablespoon of sugar. Bake for 20 minutes then reduce oven temperature to 350 degrees F (175 degrees C) and bake an additional 5-10 minutes until center is set and the edges are puffed. Sprinkle with final tablespoon of sugar and serve. Our motto this summer was "Make every day happy." 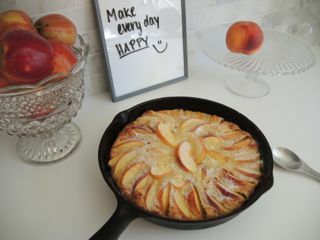 It isn't hard to do when you start the day with a juicy peach pancake.